Summary: This is a continuation of the cooperative effort begun in 2009 between David Addison Co-Director of The Conservancy of Southwest Florida’s Science Department, Dr. Katherine Mansfield, Affiliate faculty at Florida Atlantic University and National Academies Postdoctoral Research Fellow based at the NOAA Southeast Fisheries Center, and Jill Schmid, GIS Specialist, at RBNERR. The subjects for this study are loggerhead sea turtles with a documented history of remigration and inter-annual nesting events on Keewaydin Island. The intent of this project will be to satellite tag a suite of individual inter-season remigrant turtles over a period of four to five years to determine if they use similar migratory routes to return after the reproductive season and to identify their foraging areas and to determine if they return to the same foraging areas from nesting season to nesting season. The data obtained from this effort will also augment existing data on post-nesting loggerhead movements from other nesting beaches along the Gulf Coast. Data from turtles that nest on different beaches will help us determine if there are areas in the Gulf of Mexico are a foci of inter-annual foraging and, depending on their location, assess risks to loggerheads from commercial fisheries in the Gulf of Mexico. 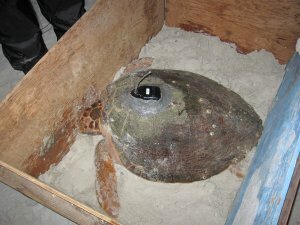 Results: Seven Keewaydin Island nesting loggerheads were outfitted with satellite transmitters during the 2010 season. All seven were deployed during a two-week period at the end of June, essentially the mid-point of the nesting season. Six of the seven satellite turtles were healthy remigrants. The shortest transmission was from a turtle which swam a broad inter-nesting loop south into Florida Bay, nested for a second time and then swam north to the mouth Tampa Bay. This is likely her resident foraging area. Another turtle swam north to an area 15km southwest of Sanibel Island. It appears she nested on or near Ft. Myers beach in early July before returning to the offshore area near Sanibel. Another turtle was satellite tagged during her fourth nesting. After release she swam approximately 50km due west of the Keewaydin, likely returned to several more times before heading west and remaining approximately 10km southwest of Keewaydin until transmission ended. Another turtle made a loop to the west of the island after release, likely nested again then swam south/southeast, perhaps nesting south of Marco Island/Ten Thousand Islands, before returning north to nest once more on Keewaydin. After this final nesting, she swam north/northwest 350km to an area about 100km offshore Crystal River, where she remained until October when she shifted the center of her activity southeast about 50km perhaps in response to cooling temperatures. Another turtle traveled 100km south into Florida Bay, about 40km west of Lake Ingraham where she has remained. The final turtle swam due west of the island approximately 40km before returning to nest. She then swam northwest 30km and returned to nested once more. After this final nest, she traveled over 450km northwest into the Gulf to an area 70km due south of Eastpoint where she has remained.